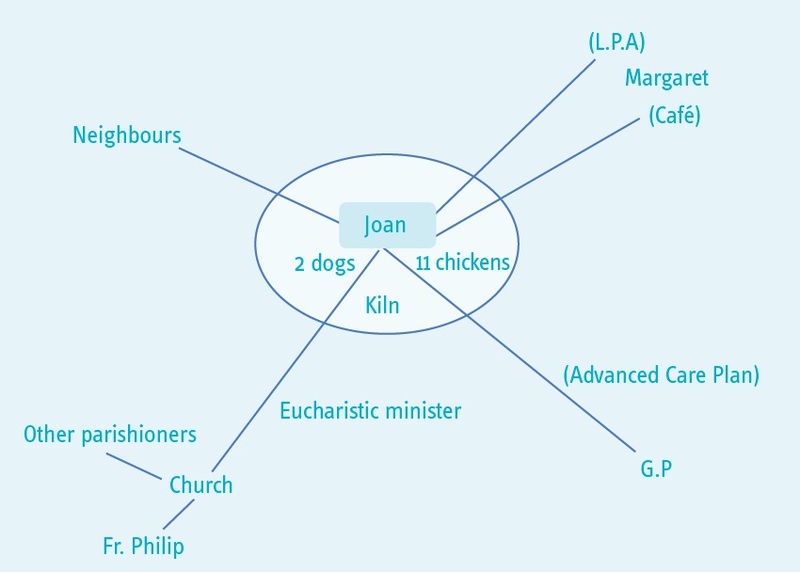 Joan lives in a house in a small village. She has lived there for 28 years. She has two dogs and 11 chickens. Joan has always been quite private but is well known in her village. She goes to the nearby town on the bus to church, visits the local shop and community café, and goes away frequently. Joan goes for a long walk with her dogs each day. Joan hadn’t been to her GP for 6 years. The café owner, Margaret, was worried about Joan. Joan has appeared very forgetful and disorientated. She has been seen in the village wearing her slippers and her neighbours have seen her out late at night with her dogs. Margaret went to Joan’s house and wasn’t allowed in but thought there was quite a strong smell. Margaret phoned the GP in the village who went round to Joan’s house and persuaded her to have some tests. She has been diagnosed with moderate dementia with Lewy Bodies. The GP phoned social services and you go out to do an assessment. You told me that you didn’t really want to have an assessment. I explained that your GP had asked me to talk to you about what is happening for you at the moment because you have been diagnosed with dementia. You agreed to the assessment but you don’t want to have lots of information about you written down. These are the main things that you were happy for me to know. At the moment you have capacity to make decisions about whether to have support or not. In the future you may find it more difficult to make decisions or not be able to make a particular decision. We talked about you arranging a lasting power of attorney and also doing an advanced care plan. You said that you are quite a private person. You have two dogs and 11 chickens. You like to walk the dogs, go to the café and go to church in Lyme Regis. You take eggs to the café for Margaret (the owner) to sell. You are a talented artist and have a small pottery shed and kiln in the garden. You like to plan trips to different local areas and travel using the bus. Your family is in Ireland and you haven’t seen them for many years. Your Catholic faith is important to you. You are a Eucharistic minister and you take holy communion to parishioners who can’t get to church. Your GP asked me to come and see you because you have been diagnosed with moderate dementia with Lewy Bodies. You told me that you understand this is similar to Parkinson’s disease. You have noticed that your muscles have been aching and that you are not sleeping well. The GP explained to me that you might find that you are unsteady at times or have tremors, and you might have some hallucinations, as these are common with this kind of dementia. Margaret told me that you have been into the village wearing your slippers and that your neighbours have noticed you being out late at night which you agreed is unusual for you. However, you also told me that what you do is your own business. We talked about the risks that are attached to you going out late or not wearing appropriate clothing. You told me that you don’t think it is a problem, as you have always walked a lot and always find your way home. Also you said that you have the dogs with you when you are out and they know their way home. You already used reminders around the house so you said you would put a reminder on the front door to check your coat and shoes. We talked about how you were managing day to day. You told me that you think you are managing well. However you haven’t been able to put the rubbish out or to clean out the chickens. You also have not been able to clean the bathroom. This is because you sometimes feel dizzy and your arms ache. You are concerned that people, like me, might start interfering with your life because of your illness. You said that you want to continue to live in your home, looking after your animals, and doing the things that you currently do. We talked about what you think will happen and you said that you knew you will become less well. If you did need help in the future, you would like to arrange this yourself. We talked about having a personal assistant in the future. We talked about the importance of you having the right support in the future. You agreed that I could share this assessment with Margaret and your GP so that if you are not well enough to ask for advice or assistance in the future, they can ring the council. You will discuss a lasting power of attorney for finances, and health and care for Margaret. And you will do an advanced care plan with your GP. You will also talk to your GP about any medical support that might be available now, for example memory clinic and help with sleeping. We also called your Parish Priest, Father Philip, and let him know that you have been diagnosed with dementia. He will ask a parishioner to give you a lift to church if you aren’t able to go on the bus. You agreed to some help with keeping the animals and putting the rubbish out. Margaret and you will make an advert to put in the café window. You said you are a very independent person. You have managed your home and finances for many years. You are managing well despite your illness and have strategies in place for things you might forget. You are active and have wide interests and talents. You also earn money through selling eggs. You contribute to the community through the parish. You are familiar with your local area and are used to travelling around. You have a good relationship with Margaret, with your parish priest and with your GP. They are all willing and able to offer support. You have recently been diagnosed with dementia. This is starting to have an impact on your life and because of the nature of the illness the impact will increase as time goes on. You have a lot of strengths to draw on and a good support network. You want to remain independent and, although there are some concerns about how you are managing, these are currently relatively minor and you have identified how to minimise them. It is important that you plan ahead so that you remain in control of what happens and so that you can continue to achieve what matters to you for as long as possible. You are not currently eligible for care and support under the Care Act 2014 because you can currently manage all day to day activities, apart from needing some help with maintaining your home. However, we have done a care and support plan that says what you will do to get help with the house and to plan for the future. See care and support plan.